/ Can Rabbits Eat Spinach? Spinach is known for being a superfood because it’s packed with so many vitamins and minerals. The best part about it is it’s not just a superfood for you; it’s considered one for your bunny, too! 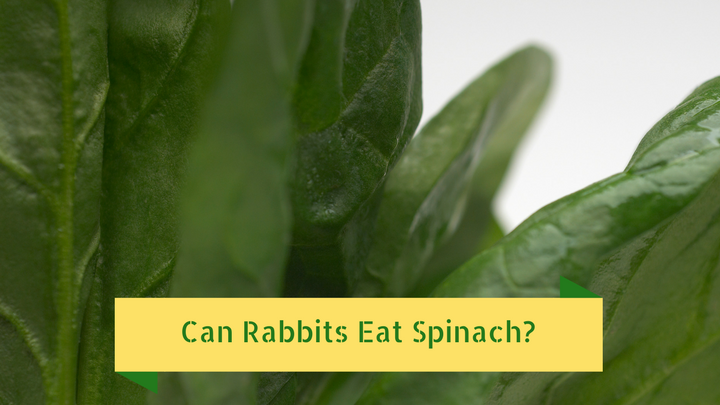 Can Rabbits Eat Spinach – and In What Amount? Absolutely! Spinach is one of the best vegetables you can give your bunny. Whole, raw spinach leaves serve two purposes: as roughage for digestion and as a good source of vitamin A, necessary for healthy growth. The only downside to spinach is the oxalates it contains. When consumed in large portions, these organic acids can build up in your bunny’s system and become toxic. It would take a lot of these acids, though, so keep providing your bunny with a varied diet and it won’t be an issue. It’s also very high in calcium, and too much calcium negatively affects their kidneys and causes their body to lose too much phosphorous. Spinach should be fresh and raw. Don’t ever cook it, and if the spinach is starting to turn (unpleasant smelling, slimy), then toss it. Don’t risk giving your bunny a bacterial infection. Remember that just because spinach is a superfood, it doesn’t mean it should be the only vegetable your bunny gets. It’s very healthy in moderation, but when it’s overfed, it starts to cause problems. Ideally, your bunny should get spinach once or twice a week as you balance it out with other fresh produce. If your bunny is a slow eater, don’t store their spinach servings in piles. This speeds up the breakdown of spinach as it sits in room temperatures, so try to spread the leaves out a bit. Whether you feed your rabbit organic spinach or not is up to you. Organic spinach is certainly lower in pesticides, but whether it’s ideal for your rabbit is a decision to make with your veterinarian. Spinach should be a moderated staple in your bunny’s diet. This means it should be given at least once a week but no more than twice a week to be considered a beneficial addition to their dietary plan. Are Raspberries Safe For Bunnies? Are Bananas Safe for Rabbits? RabbitSafety.com is a participant in the Amazon Services LLC Associates Program, an affiliate advertising program designed to provide a means for sites to earn advertising fees by advertising and linking to Amazon.com. *Amazon and the Amazon logo are trademarks of Amazon.com, Inc., or its affiliates. Additionally, RabbitSafety.com participates in various other affiliate programs, and we sometimes get a commission through purchases made through our links. Copyright text 2016 by Rabbit Safety.